if you barter for goods or services. but I have been asked. I'm never really quite sure how to respond. Recently, we've had a couple occurrences that got me to thinking. I wasn't entirely sure what to think. expecting nothing in return and were "repaid" kindly. The other is actually the story I would like to share with you. Mr. LB has a friend who raises bees - lots of bees. We asked if we could purchase some beeswax from him when it was harvested. We (Mr. LB) told him about how much $ worth we would like. It was some time before he said he had some for us. Mr. LB stopped by after work. his response was, "Awe, don't worry about it. I'll be needing some metal work." He indeed needed some metal work a few weeks later. Mr. LB was only too glad to deliver. but I kinda think of it as paying it forward. I'll work 3 hours for the use of XYZ item. of either goods or labor. it's better to be owed than to owe? I don't think that means only money. The other great part of it is the not keeping track. it's very freeing not to have to remember. anything done. Then when it was done would ask how much he owed. We could then have responded, "Awe, don't worry about it. We'll need some beeswax sometime." 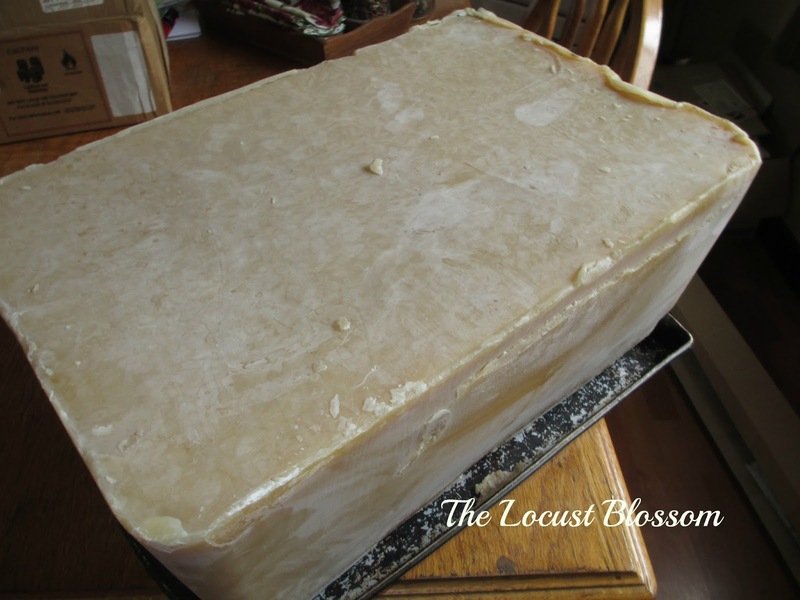 This block of beeswax should last me some time. I am still in complete awe. And thank you Love (Mr. LB:). I like paying it forward better, I think. We like to help our neighbors out too, and never want to accept payment, but kind of like I'll help you, and you help me out kind of thinking. That is one huge chunk of beeswax! That should last you a long time! There used to be an elderly gentleman in my neighborhood who was extremely talented at anything mechanical. He never charged me anything, but I always took him anything mechanical or electrical that I ran across and he added it to his "parts" inventory. Anytime he wanted to build anything, he usually had what he needed, since he worked the same deal with several other guys. For goods and services I like to barter, but haven't done much of it. Last year we needed a buck to breed our does, and our neighbor did it, we payed her in hay. Nice beeswax btw, I am sure that will make plenty of candles. Some really great thoughts in this lesson. We live in a very small community (about 100 families), and we do rely upon each other for help. My husband and I both work in town about an hour away, and therefore are really busy between work and homestead chores. Sometimes, it's easier for us to just want to pay for help. And sometimes we do---but we love bartering and/or giving. My soap is a big item people are asking for. My question is how do you refuse when someone insists on paying you? Honestly, I love sharing my herbal tinctures, salves, and soaps when people ask, but payment in cash is usually given, sometimes even forced. And I feel kind of weird about that?! I enjoyed this post. We do some bartering, but like you I just figure it is sharing the wealth. I just witnessed some bartering today. I attended a Christmas craft fair. One vendor had beautiful hand-made greeting cards and another vendor had beautiful hand-made jewelry. They traded their hand-made crafts and each was happy and no cash was ever used. Really it is just sharing your talents with each other and I greatly appreciate such a mindset.